Only four Canadian musicals in history have seen the light of day on Broadway. Michael Rubinoff’s Come From Away – a heart-warming tale of kindness and generosity in the face of tragedy – is on its way to being number five. “It’s still surreal,” said Rubinoff, BA’98, LLB’01, who enlisted Canadian writing team David Hein and Irene Sankoff to bring to life one of the side stories of 9/11, in which the community of Gander, Nfld., welcomed displaced passengers from grounded flights into their hearts and homes during the dark days that followed the terrorist attacks. Rubinoff, who’s been associate dean of Visual and Performing Arts at Sheridan in Oakville, Ont., since 2011, conceived of the idea for the musical in the aftermath of 9/11 when he was a young lawyer, articling at a Bay Street firm. At the time of the attacks on the Twin Towers, 38 planes were grounded at the airport near Gander, with 6,579 passengers on board. The locals welcomed passengers into their homes to rest, gave them hot meals and showers and entertained them as well. Rubinoff was deeply moved by the outpouring of kindness and humanity shown by the people of Gander during such a frightening time and felt others would respond to the story in a similar way. 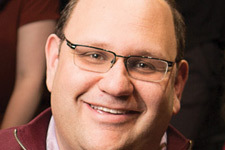 Just as he was starting his second career in academia in 2011, Rubinoff approached New York-based husband-and-wife writing team Hein and Sankoff about his idea for Come From Away and they were immediately on board. The couple travelled to Gander during the tenth anniversary of 9/11, staying for nearly a month and interviewing passengers and members of the community. When they returned, they workshopped the musical with Sheridan students through the Canadian Musical Theatre Project, an incubator established by Rubinoff to develop new Canadian musicals. Since then, the musical has played record-breaking engagements in La Jolla, California; Seattle, Washington; Washington, D.C. and at the Royal Alexandra Theatre in Toronto, Ont. where Rubinoff’s love of musical theatre was first sparked at the age of 13 during a performance of Les Miserables. Western alumna and actress Astrid Van Wieren, BA'88, plays the character of Gander resident Belulah Cooper in the Canadian cast. While both American and Canadian audiences were incredibly enthusiastic, Rubinoff said it was interesting to note the differences in responses from each nationality. Broadway previews begin on Feb. 18 and the show will officially open on Broadway on March 12. As a purple and proud Western alumnus, Rubinoff is pleased to host a group of New York-based alumni on Founder’s Day on March 7 at the show.